Osteoarthritis or wear and tear of the hip - what is it? Osteoarthritis or wear and tear of the hip joint is the result of a loss of cartilage in the hip socket and the femoral head. This progressively leads to rough contact between the underlying bone of both bones. This causes pain (usually in the groin) and inflammation of the joint capsule. The body reacts by producing extra bone on the edge of the joint (osteophytes), which reduces mobility. This manifests in stiffness at the beginning of a movement, reduced hip flexion, hip abduction and hip rotation. On an X-ray the main characteristics of osteoarthritis visible besides osteophytes are cysts (cavities) in the bone just below the joint and a narrowing of the joint gap. Wear and tear of the joint’s smooth layer of cartilage is the main reason for deciding to have a hip replacement. There are several causes that could lead to a loss of cartilage. 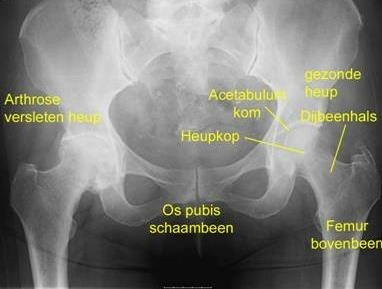 The most common are old age, rheumatism, a previous accident, avascular necrosis, congenital hip dysplasia and femoroacetabular impingement. Treatment for osteoarthritis consists of four parts. It always begins with a conservative (non-surgical) policy in which pain medication plays an important role. This is often initiated by your general practitioner. Paracetamol is an effective painkiller that can be useful in the first phase of osteoarthritis. When pain flares up an anti-inflammatory (NSAID) can provide relief for a short period (two to three weeks). An NSAID must not be taken for long periods because of the risk of ulcers/bleeding and damage to the kidneys. Glucosamine preparations do not have any proven general effect, yet some people respond well to them. They certainly do no harm. This is often combined with physiotherapy to keep the hip joint supple and teach muscle strengthening exercises. Infiltrations in the joint may be considered for young patients displaying moderate to mild signs of osteoarthritis. The option is an anaesthetic and a small quantity of cortisone, or a hyaluronic acid preparation. 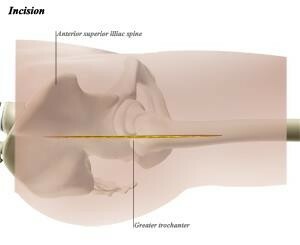 The injection into the joint is performed in the operating theatre using radiographic control of the needle to ensure the intra-articular injection is administered in the right place. If the above-mentioned substances no longer help and the stiffness and pain increases, a new hip or a total hip replacement (THR) is the final treatment. More information about a hip replacement and about living with a hip prosthesis is provided in a separate folder. A hip replacement may be performed for different reasons, the main one being osteoarthritis or wear and tear of the hip joint. Different types of hip prostheses exist. The first type is the cemented hip prosthesis (1). Bone cement is used as a filler to secure the implant in the bone. The second type is the uncemented hip prosthesis (2). With this type the implant grows into the bone. In some cases an additional screw fixation is used to provide the hip socket with extra stability. With this type the patient needs to keep the weight off the operated leg by using crutches in the early stage of recovery. 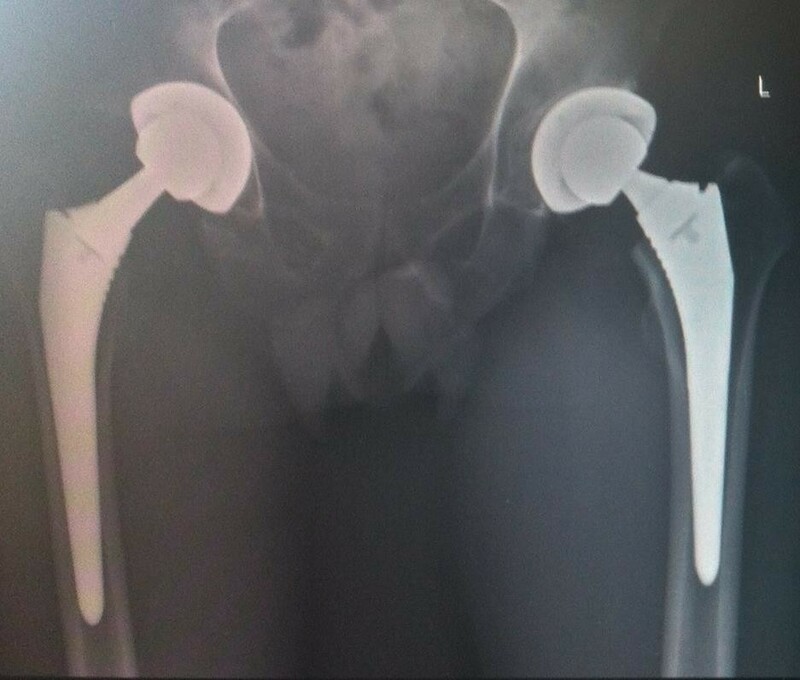 The two techniques cited above may also be combined in which, for example, the hip socket consists of an in-growth prosthesis and the shaft of the hip prosthesis is fixed in place with bone cement. The resurfacing hip prosthesis is the third type. Nowadays, this prosthesis is only used in young men with no excess weight to minimise the risk of any consequences of metal ions. This type involves a ‘new surface being created’ for the hip ball and socket. The prosthesis is fitted over the hip ball (femoral head) like a bicycle bell. A hip prosthesis is inserted via an incision in the upper leg. There are several access points to the hip joint. Traditionally an incision approximately 10 to 15 cm is made on the outer side of the upper leg for posterior or anterolateral access. 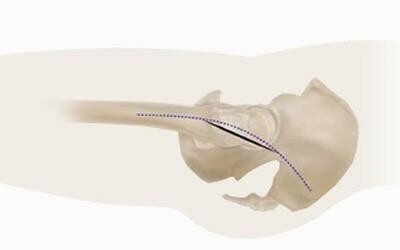 Another option is a mini-invasive access point in which fewer or no muscles need to be detached. This offers the advantage that recovery is slightly easier the first few weeks. This technique can be used for a posterior access point in which an incision measuring eight to ten centimetres is made on the outer side of the upper leg. If, during the operation, it does not prove technically possible to insert the prosthesis correctly via this smaller access point, the surgeon will resort to the traditional posterior access point. 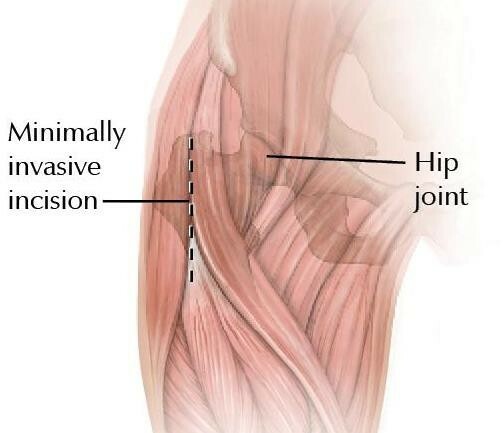 Another mini-invasive technique to insert a hip prosthesis is via an anterior access point in which the incision is made on the front of the hip: longitudinal or transverse in a skin fold (bikini incision). No muscles are detached using this technique. 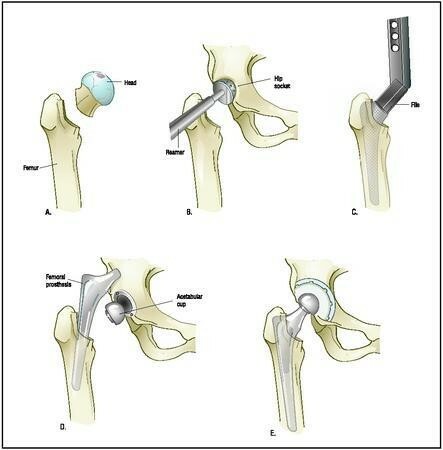 It is mainly applied to insert a traditional hip prosthesis. Your surgeon will always discuss with you the type of hip prosthesis that is most suitable in your particular case. 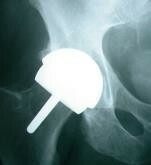 Hip replacements are usually very straightforward. Over 95% of patients are extremely satisfied and feel great after the operation. 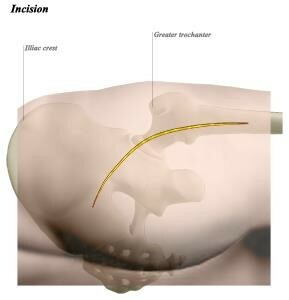 However, as is true for all operations, there is also a risk of a complication occurring with a hip operation. Nowadays, most procedures are standardised to a high degree to minimise the risk of any complications. Nevertheless, they can never be completely ruled out. Below we provide a summary of all the possible complications, for the sake of completeness. Antibiotic treatment is recommended for an infection of the wound or deeper lying material. A new operation is also required in many cases, which does not benefit the result of the initial procedure. Therefore, when it comes to surgery involving prostheses it is important to wash using disinfectant soap before the operation and to strictly ensure proper aftercare of the wound after the operation. Superficial thrombophlebitis is an inflammatory condition of the veins or arteries close to the surface of the skin. This is of a temporary nature and no specific therapy is started as a result. Deep vein thrombosis (DVT) is a blood clot (thrombus) in the deep veins or arteries of the leg. There is always a higher risk of DVT following an operation. To limit this risk you receive white TED stockings and medication in the form of pills or injections in your abdomen. It is also extremely important that you are mobile. A patient that is very mobile and regularly tenses the muscles significantly increases his or her protection. To prevent bleeding a drain is sometimes left in the operated zone after an operation. It will be removed before you are discharged. Post-operative bleeding will often stop on its own. If you have lost too much blood you will receive a blood transfusion. Nerve injuries may occur as a result of actions performed during an operation. This is often a temporary condition that improves by itself. If you experience any sensory disturbances inform your doctor. 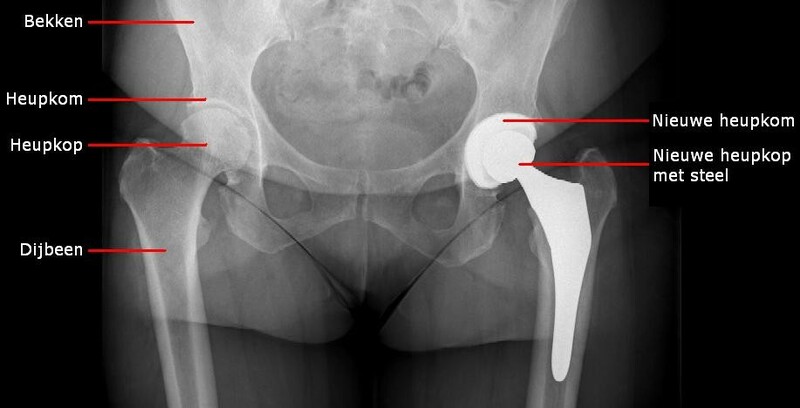 There are a number of specific points of concern regarding a hip replacement: A hip prosthesis may dislocate, an extremely rare complication when inserting a first hip prosthesis. The cause of dislocation is always investigated. If this is the first time, the prosthesis is put back into the socket under a brief anaesthetic. If it occurs repeatedly there is often an underlying reason and you will need another operation. A minor difference in the length of the leg may sometimes be unavoidable to achieve a stable configuration for your hip replacement. If this bothers you it can be remedied by using a shoe insert or other item to achieve the same effect. Always contact a doctor if you experience one of the following problems: fever, increasing swelling, heat or progressive pain, redness, running wound, functional problems or if you suddenly experience shortness of breath. A general explanation about revision hip replacement is extremely difficult because it often differs significantly from one case to another. Revision hip replacement is recommended if a primary (first) hip replacement fails. There are different reasons why a primary hip replacement could fail over time. The most common causes are an infection of the prosthesis material, detachment of the prosthesis material, wear and tear of the sliding surfaces of the prosthesis material or repeated dislocation of the prosthesis. If there are no signs of infection the worn or detached parts can be replaced in the same operation (one-stage revision). If there are signs of infection, the material must be removed. Sometimes an artificial fracture has to be made to the upper leg to do so. Antibiotics must be taken for a number of weeks afterwards (usually six). Your doctor will also closely monitor your blood test results. The new components can be inserted once everything is back to normal. (Two-stage revision) You must take into account that in most cases rehabilitation will be considerably more challenging and a longer stay in hospital can be expected than with a traditional hip replacement. In some cases your doctor may ask you to keep weight off the operated leg for several weeks (usually three).